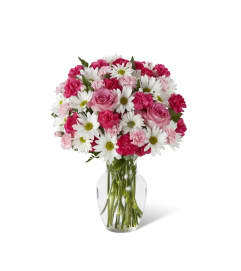 FTD® proudly presents the Better Homes and Gardens® Sun's Sweetness™ Rose Bouquet. Displaying a collection of sunset hues, this rose bouquet is a wonderful way to delight your special recipient. 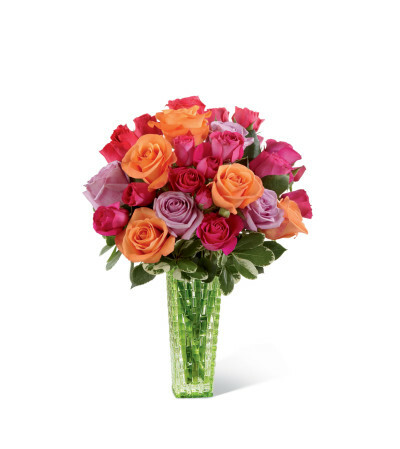 Orange roses, lavender roses and hot pink spray roses are beautifully arranged amongst lush greens to create a flower bouquet that will capture their every attention. 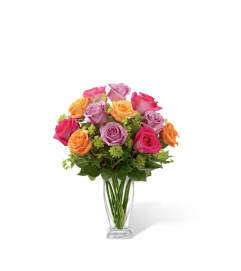 Presented in a designer green glass vase, this flower arrangement is the perfect way to say happy birthday, offer your congratulations or convey your heartfelt message of love and affection.